Ex-Jakarta Governor Basuki ‘Ahok’ Tjahaja Purnama’s blasphemy trial will come to an end on Tuesday. But even if convicted, a jail sentence is unlikely. The accusations against Chinese-Christian Ahok stem from a reference to a Quranic verse last September, a crime that carries a maximum five-year jail sentence. 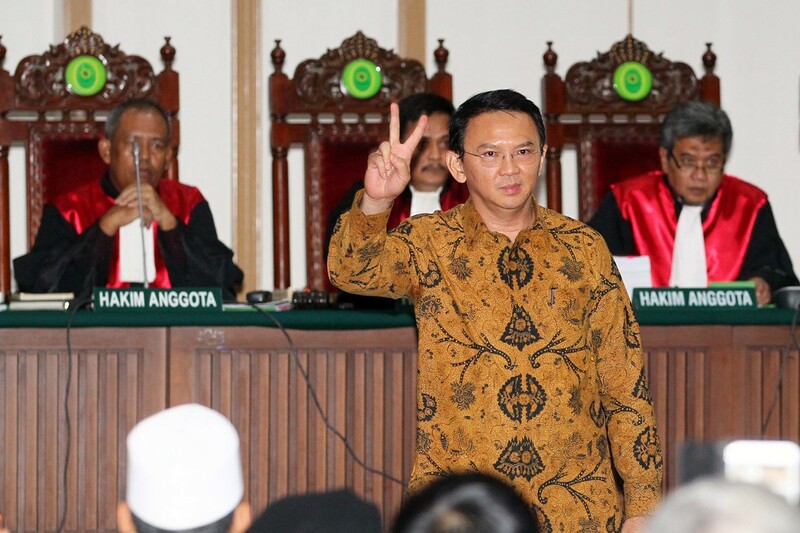 However, prosecutors have instead recommended two-years probation, with a 12-month jail term only if Ahok reoffends. Prosecutors are likely recommending the reduced sentencing due to a lack of strong evidence. None of the prosecution’s witnesses had heard Ahok’s controversial speech directly; instead, they had viewed an edited video that allegedly took Ahok’s words out of context. Despite repeated reassurances from the Supreme Court that Tuesday’s judges will act independently and the appointment of a Judicial Commission to monitor the case, political pressure to convict the former governor is immense. If Ahok is declared guilty on Tuesday, his sentence is likely to be equal to or less than the prosecution has put forward, as Indonesian judges rarely exceed prosecutors’ demands. Dig deeper: Indonesia’s identity politics: a new normal?